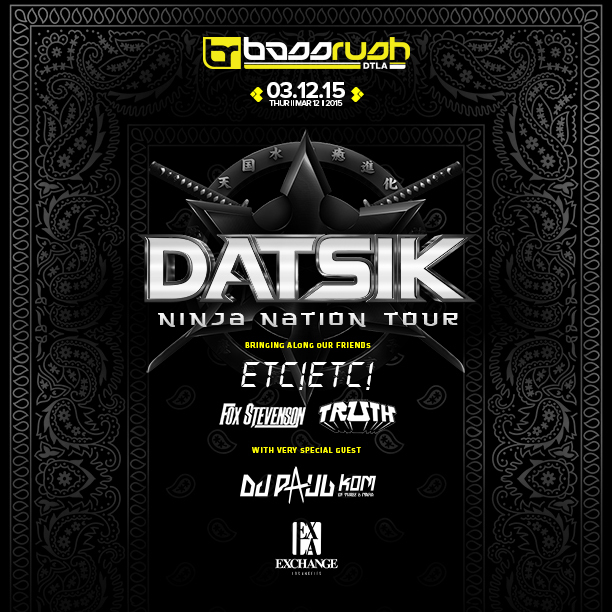 Datsik’s Ninja Nation Tour hits Los Angeles! Bass heads crowded the streets outside of Exchange LA in Downtown Los Angeles last Thursday, eager to see the one and only Datsik! Most fans that are familiar with his productions, expect nothing less than a sweaty night and grimy bass – my boyfriend I included in those few rowdy bass heads. As huge fans of live dubstep, we are always excited to experience the pulverizing bass that dub shows bring. Personally, I have caught Datsik at his live shows for what feels like a thousand and one times since I first became a fan back in 2010. No matter how many times I have seen him play before, I can’t help but go crazy as soon as he hits the stage, mainly because I know what his shows entail. 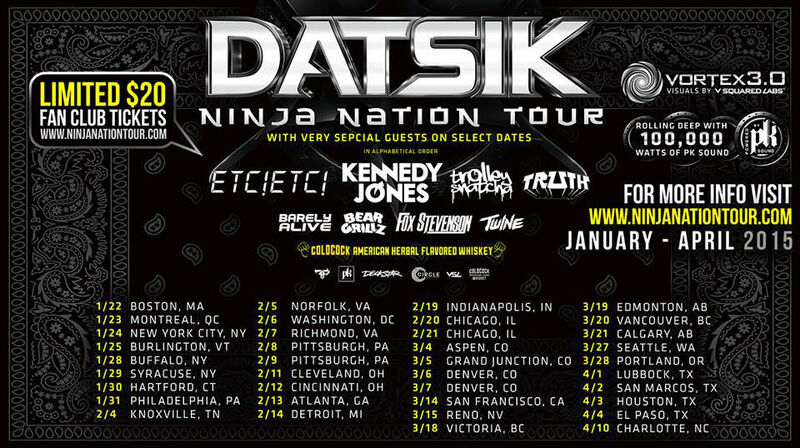 This has been Datsik’s most hyped and anticipated tours yet, mobbing through over 30 cities from late January until early April. Watching Datsik slowly take over the bass music scene and continuously see it evolve over the last few years has been nothing short of inspirational. He has succeeded in staying on top of the game, recruiting more fans dubbed ninja’s and running his own label known as Firepower Records. It is always rewarding to watch an artist climb their way to the top and know you have been there to help make their dreams come true while doing something you love too. Over the years, I have become such a huge fan of Datsik so I wasn’t only excited to see him play once more, but I also won two tickets paired with a meet and greet with him! I brought my boyfriend, Alfonso, along to experience it with me. We were super excited to meet him since we have both been huge fans of his for years! 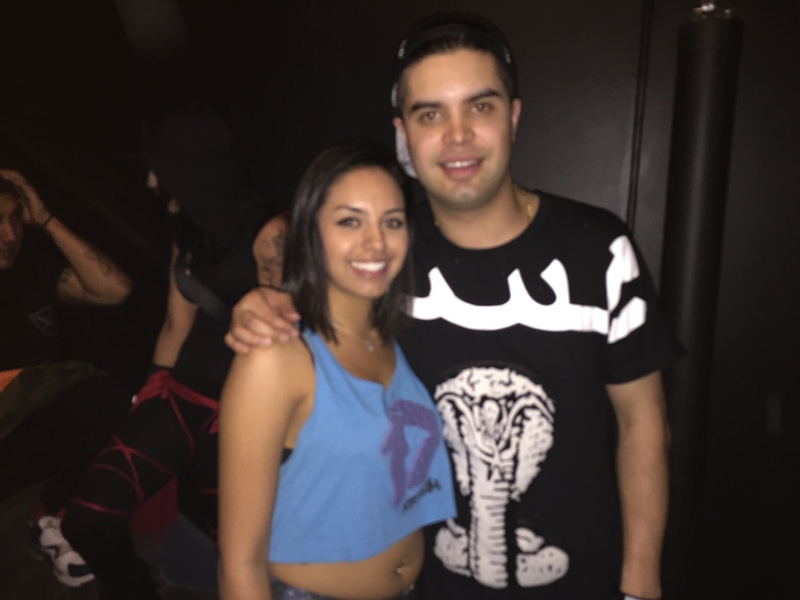 Bianca and Datsik during Meet and Greet. Bouncing between interviews with the press and handing out free shots of whiskey to his fans at one of the bars in the club, Datsik had a tight schedule that night. Finally, we were escorted backstage for our meet and greet. Once backstage, we immediately spotted him standing in the back of the room waiting for us. He welcomed us with a smile on his face and said, “Hi, It’s nice to meet you. I’m Troy.” He asked us if we wanted a picture and chatted with us for a few minutes before we were on our way. Datsik showed us how extremely appreciative of his fans he is by simply taking a few minutes out of his busy schedule to meet us. It totally made our night! 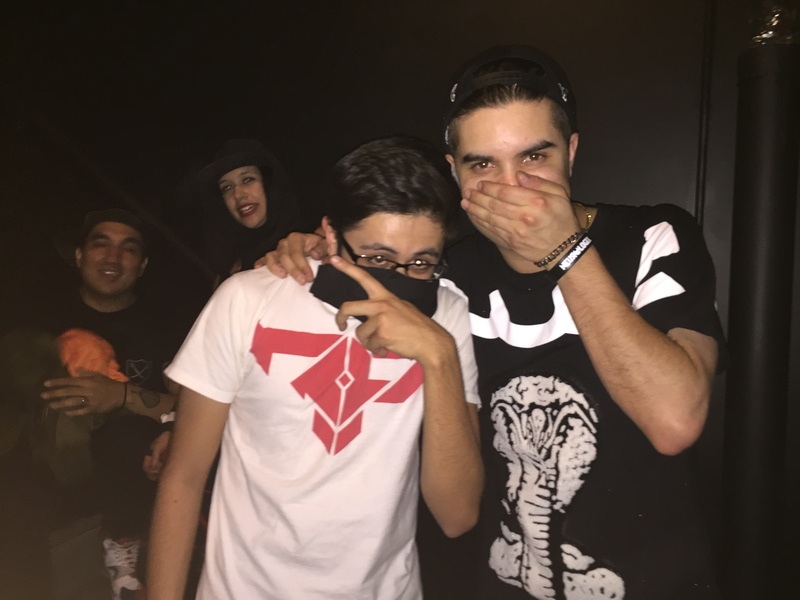 Alfonso and Datsik during Meet and Greet. “My favorite part of the night was seeing Datsik play and being able to meet him with my girlfriend. That’s as legendary as it gets for the bass music scene,” says Alfonso. “In a genre as aggressive as dubstep it is rare to find girls who truly appreciate and understand what this is all about,” he said. New Zealand duo known as Truth, opened for Datsik delivering a much tamer set than what he would later annihilate the crowd with. The pair kept it mellow staying away from a full on dubstep or trap set by playing an even blend of deep bass music throughout their entire set. “I recognized new talent that I had previously kind of rejected before, based on their first Firepower release. This doesn’t really happen too often for me at shows, so it was a nice surprise,” says Alfonso. Next, Datsik took the stage causing the crowd to go wild during the unveiling of the hypnotic visual show known as the “Vortex.” Assisted by the massive PK sound system, the brain rattling bass prompted mosh pits through the entire club. The mob wore permanent bass faces throughout his entire set as a result of the continuous ruthlessness of his beats. Like clockwork, ninja’s went completely bonkers with every drop thrown at them. Datsik’s music inspires nothing short of havoc, but that’s the beauty of it and there is nothing quite like it.